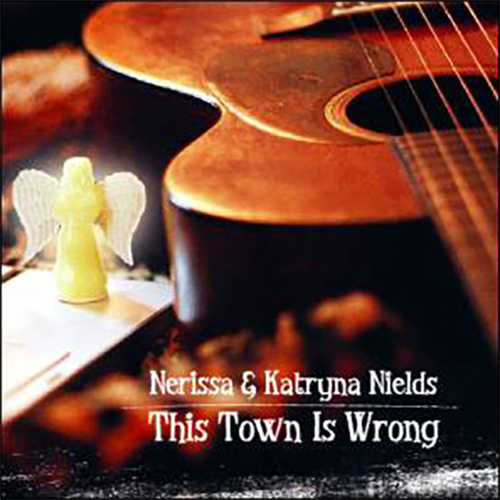 The 11th outing by Nerissa & Katryna Nields (in one form or another) is the soundtrack to a novel by Nerissa of the same name about a pair of 13-year-old girls who take on the mantle of rock in order to ease the pressure of adolescence. You’re right, as concept recordings go, this is the least pretentious one in pop history. The Nields are one of those duos whose entwined voices sound like the output of one enlightened, street-savvy, quirky singer, who is not only making sense of the world around her as she sings, but is imparting the found wisdom and folly of it as she goes. This has been true in all of Nerissa Nields’ songs — she writes with the notion of a plural voice becoming one. The songs in This Town Is Wrong reflect that there is strength in numbers even in the most awkward of circumstances. There is a plethora of voices represented here; there are the two protagonists, gal pals Randi Rankin and Angela Riddle, and Randi’s dad, a rambling, barely-there songwriter named Guy. The other voice is that of a tough local rock band called the Big Idea. Over 12 songs, the colors in the novel come to life and stand as a pop/rock testament unto itself, full of irony (which almost no one does anymore), hope, disillusionment, anger, innocence, and wide-eyed wonder as it gives way to the unromantic knowing glare of everyday life. Folk, country, indie rock, and jangle pop are unified by a ringing electric 12-string that acts almost as a narrative device unifying the disparate voices into a single broken, struggling, yet hopeful desiring machine. Picking out songs here is ridiculous. They all flow and bleed into one another as voices express from their own unique places that certain emotions, longings, dreams, and disappointments can be bridges in seemingly disparate lives. This is a gorgeous recording, full of complex emotions with singalong choruses and messages that bring light into the darkened heart. Nerissa Nields is one of the most empathetic songwriters anywhere. And with Katryna’s voice adding the dimension of heaven to her earthy view, This Town Is Wrong becomes perhaps their most focused, humorous, and poignant outing yet.